Welcome to Bricolage, the ever-evolving inspiration board of Brianne Cain. 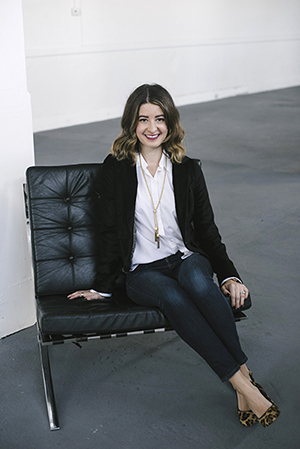 Brianne holds a BA in Art History and spent her twenties working in the fashion industry and as a marketing and branding consultant for small businesses. After spending time living on both coasts, today Brianne is based in her central California hometown and enjoys having family and friends nearby. A self-described "world traveler meets homebody," Brianne equally lives for planning the perfect itineraries to far-flung locales and watching Netflix on the couch, snuggled up with her husband Brandon, their labradoodle pup Brinkley, and a glass of red wine. From Brianne: "I founded Bricolage in September of 2010. After graduating college, wrapping up my wedding blog, and moving across country, I felt isolated from people who shared common interests and was seeking a venue to explore my purpose while connecting with people and sharing things that I loved. Over the years, this little blog has seen me through multiple stages of my life and become a resource for living and traveling stylishly. Why "Bricolage?" Ever since stumbling upon the term during an Art Theory course in college, it's been one of my favorite words. Its definition: "something constructed or created from a diverse range of available things." This concept speaks to my resourceful, vintage-loving soul, and who doesn't love a word with one's name hidden in it? Sharing/Reblogging: All content on this blog belongs to me unless otherwise noted. Please feel free to share my posts and photos, but I do ask that you appropriately credit them, linking back to Bricolage. If at any time you notice an image is improperly recognized on this site, please let me know so I can quickly update the information. Advertising: In 2012, I began using display advertisements and selective affiliate links. Brands and products featured on Bricolage remain uninfluenced by potential commissions, and I promise to be upfront and honest regarding advertising. Play Nicely: It is my intention for Bricolage to be a happy place for everyone. Inappropriate, promotional and needlessly negative comments will be deleted. Sponsors and Collaborations: If you would like to partner with Bricolage through advertising, giveaways, etc., or if you have questions or something stylish to share, please email bricolageblog@hotmail.com.